Former Hewlett-Packard CEO Carly Fiorina on Sunday braved the collapse of part of a stage in San Antonio to pitch her outsider experience to a national meeting of women business owners. SAN ANTONIO — Former Hewlett-Packard CEO Carly Fiorina on Sunday braved the collapse of part of the stage here to pitch her outsider experience to a national meeting of women business owners, telling them the government and politicians in both parties are making their jobs more difficult than ever. "The reason it feels harder for you now is because it is," the Republican presidential hopeful said in an evening address to the National Women's Business Conference. "We're destroying more businesses than we are creating. We are destroying the chance ... for a woman coming along behind you to do what you have done." The solution, Fiorina suggested, is to put an entrepreneur in the White House as opposed to just a manager, who has to "operate within the status quo." Fiorina, who has been running as a candidate untainted by the dysfunction of Washington, D.C., also used her remarks to blast a "political class" that has stifled economic growth across the country. "There are many good politicians, but what is the business of politics? Words," Fiorina said while discussing immigration reform. "That is not your business. That has never been my business. Our business is results." About 10 minutes into Fiorina's remarks, the floor-to-ceiling curtains behind her began wobbling and seconds later collapsed on to Fiorina as well as a few other women on the stage. Once it was clear no one was hurt, the crowd made light of the situation, some joking about Fiorina "bringing down the house." "Trump!" 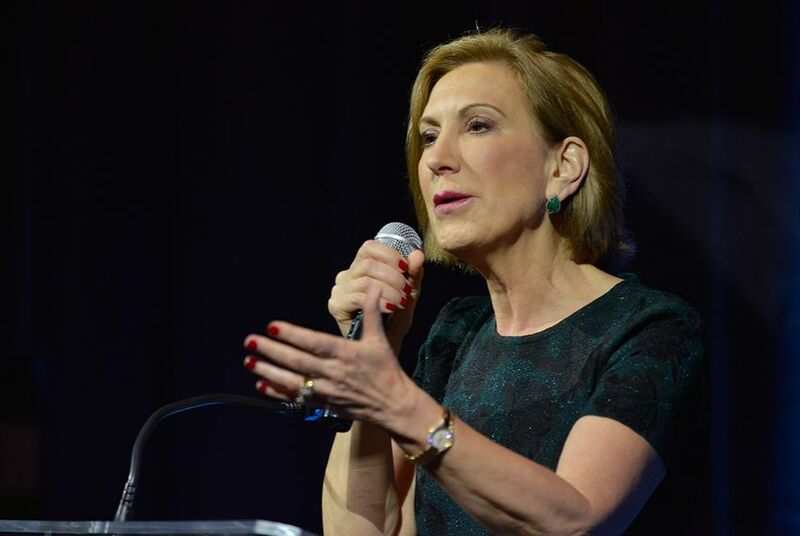 an audience member shouted out, referring to Fiorina's chief antagonist in the GOP field. Republican presidential candidate Carly Fiorina is covered by building security as the estimated 18ft. tall background and rigging collapse during her speech to the National Organization of Women Business Owners collapses in San Antonio, Texas on Sept. 27, 2015. Fiorina was uninjured. "Trump, Hillary — it could have been lots of people," Fiorina replied as she took the stage again. Later in her remarks, she appeared to take a shot at the flamboyant billionaire, saying leadership is "not about your office. It's not about your helicopter. It's not about your ego." Her campaign confirmed later Sunday evening she was not hurt in the stage snafu. It was not immediately known what caused the incident. Shortly after the collapse, Fiorina began taking questions from the audience and received some of her loudest applause while explaining she would compete with the "big boys" if elected president. "News flash: I've been competing with the big boys all my life," Fiorina said. "In fact, this is more of a unique experience for them than it is for me." Fiorina's appearance in San Antonio was the only public event in a three-day swing through the state that is expected to also include private events in the Dallas-Fort Worth area. She is scheduled to leave Texas on Tuesday. Fiorina, who was born in Austin, has been drawing praise from Texas Republicans including former Gov. Rick Perry, who dropped out of the presidential race earlier this month, and Gov. Greg Abbott, for whom she campaigned last year. Fiorina has secured the endorsement of former Comptroller Susan Combs, who recently praised the former executive for standing up to Trump. Dona O'Bannon, a member of the conference since 1974, said Fiorina was well received Sunday by an audience with varying political views, not all in line with the GOP's. "I think at least 50 percent of the audience agreed with everything," O'Bannon said, before acknowledging the most memorable moment from the event. "I'm sorry that the pole came down and almost killed her."